What Is a Stick Blender and Why Should You Get One? What is a stick blender? Also known as an immersion or hand blender, a stick blender is a kitchen appliance used to blend or mix food with lower chances of creating a mess. This type of blender is extremely convenient and versatile for mixing and blending food right into a pot or bowl which eliminates the need to transfer the contents from one container to the another unlike with the traditional counter blenders. Stick blenders work well in blending liquid batters, smoothing lumps on gravies, processing pasta sauce chunks, and pureeing baby foods at small amounts. Yes, unlike the standard counter blenders, stick blenders can blend smaller amounts of food which makes it very handy. Aside from the lesser need to clean up, you can also save left-over food such as fruits and salads by blending them into smoothies or sorbets. Why Should You Choose a Stick Blender? Apart from being compact and handy, what else does this little piece of machinery has in store for you? Here are some of the reasons why you should get a stick blender. You will not find it difficult to get one that is of high-quality at a reasonable cost because immersion blenders are affordable compared to traditional counter blenders. Contrary to what most people think, stick blenders are not only used to make soups. They can do so much more than that, and you will be surprised by the variety of recipes you can follow with the use of your immersion blender. It works fast allowing you to try out different recipes in just a matter of seconds to a few minutes! You will only end up cleaning the pot or bowl where you mixed your food plus the blender piece, and you are good to go. There is not much cleaning to do since you did not have to transfer your food contents from one container to another. It is light and handheld which make it so easy to maneuver. You only need to immerse it into a bowl or pot of food or ingredients and start mixing, which is way easier compared to having to drag out a heavy mixer or blender with lots of parts and attachments. What Should You Keep in Mind When Using a Stick Blender? 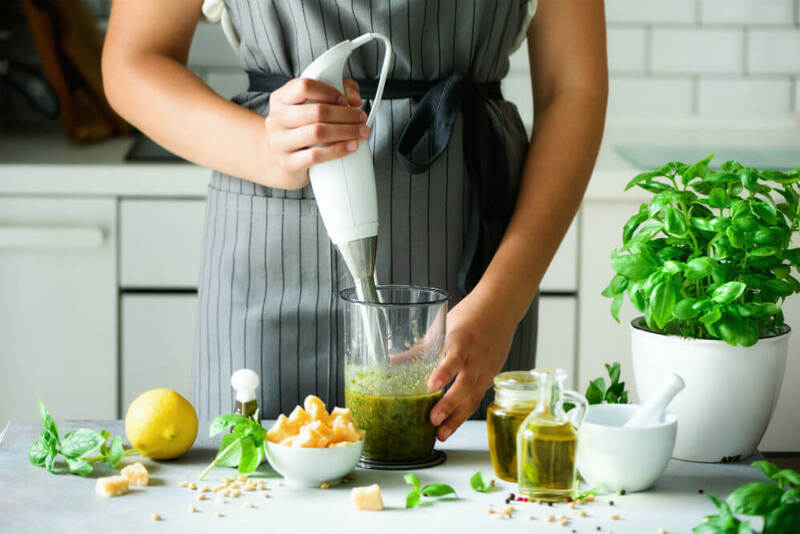 Stick blenders work amazingly and will give you a whole new cooking experience, but like any other tool or appliance, there are things to keep in mind when using and caring for your blender. Wash and clean it as soon as you are done. The stick blender blade has hard-to-reach spots. If you let stains sit in there for a long time, then it will be more difficult for you to remove them. A workaround is to soak the blade in a container with hot water long enough to soften the hardened food contents stuck on it before scrubbing them away with a soaped-up sponge. When in use, move it around. Make sure that you move the stick blender up, down and around to pick up everything and mix them evenly. Bonus tip: when blending ingredients for soup, make sure to stir using slow motion, so you do not miss any big pieces, and you get best results. Allow hot dishes to cool first before blending. Some stick blenders are capable of working on hot dishes. However, for safety purposes, it is best to cool the food first before blending. When cooking, turn off the fire or remove the pot from the heat to avoid spilling hot liquid on yourself. What Should You Look for in a Stick Blender? We know that it can be tricky to find the right kitchen tool, especially when faced with so many options. Here are some questions that you may ask when you go shopping for your stick blender and why. How powerful and strong is the motor? Stick blender models have a wide variety of motor power ranges, and most tasks will require a power of around 200 Watts. Aside from blending soup, you might want to consider other heavy-duty use such as crushing of ice. Are there different speed controls? Usually, models with multi-speed controls offer a high level of precision and flexibility, but there are also types which only include the basic high- and low-speed options, which can also be good in terms of ease of use and simplicity. How many different functions are there? The basic models may include one or two functions, but some of the more advanced and expensive models include many attachments which then make the stick blender a multi-purpose kitchen appliance. Some attachments may consist of whisks, chopping tools, frothers, or blades which all serve different purposes. More often than not, the blade will be made of stainless steel. What you should ask for is the material of the blade shaft since you would want it to be made out of stainless steel too and not plastic. Does it get hot with prolonged use? If the material of your stick blender gets hot with prolonged use, then it can pose a danger and risks. It is then highly advisable to learn what material your blender is made of and know if it is possible to transfer heat to its handle. Does it allow one hand operation? Ask about the balance, grip, and the weight of the blender since these features are factors of its usability. You can easily get tired if your blender is too heavy and unbalanced which will also not make one hand operation possible. You want your kitchen materials to be clean and ready for your next use. Some stick blender models include parts and attachments which can be time-consuming and hard to clean, so you might want to think about getting the one that is dishwasher-safe. So, what is a stick blender? Our discussion above pretty much gives you an idea of what it is, why should you get one, and what should you look for when searching for the right model. All you have to do now is to consider all these factors beforehand to prepare yourself and not get overwhelmed with the many options available on the market today.